In Vietnam a moto is a motorbike. In Zambia, they have the Moto Moto Museum. To them, Moto Moto is Fire Fire. Moto is also a nickname for Motorola. You have Moto Boy from Sweden. The Urban Moto magazine, the Moto programming language, another Moto Museum and Mr. Moto, the secret agent. China are famous for The Great Wall and lately, its Great Firewall, as well as its many bicycles and Vietnam is equally renowned for its motorbike population. Bicycles are endangered in Asia according to this research. Even the cyclo’s are deminishing in numbers and more tourists are seen using their services than locals. Motorbikes in Vietnam have been limited at 150 cc until 2007. Thanks to the WTO agreement, larger capacity bikes are now part of the traffic, for better or worse. One thing is certain, the traffic jams are increasing and traveling in District 1, the Central Business District (CBD), takes longer time. A motorbike can still get around faster than a car though. In a city where you can see Bentley’s cruising the street, a dedicated Porsche showroom in Phu My Hung, it was only natural to get some big name motorbikes. Enter Ducati. We got the honor of capturing the images needed for their launch. 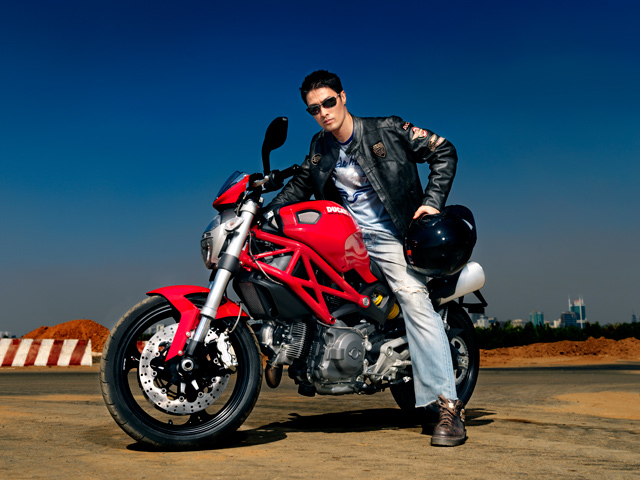 Ducati Vietnam's brand ambassador Johnny Tri Nguyen. Helmets are finally mandatory and have been so for some time. Gone are the days you could jump on your bike and let the hair flow in the wind and regret not having a helmet when a drunk driver came the opposite way and knocked you down. At least, today when the drunk driver comes, you and your head have a much better chance of survival. I am strong advocate of helmets. I use a helmet every time I ride a bike. I had in the past an ugly bicycle accident that I survived solely by wearing a helmet. In Vietnam it is not a question of “if you have had an accident” but “how many have you had”. People disrespect the traffic laws and yesterday evening, on the way home, I travelled in the motorbike lane on Saigon bridge. It is a one way lane. Suddenly motorbikes in front of me started to swerve to the side and I saw the headlights of another motorbike coming towards me at high speed. Somebody had taken a short cut and went the wrong way. It happens everyday. There is an organisation, Asia Injury Prevention Foundation, that manufactures safe helmets. I buy my helmets from them. 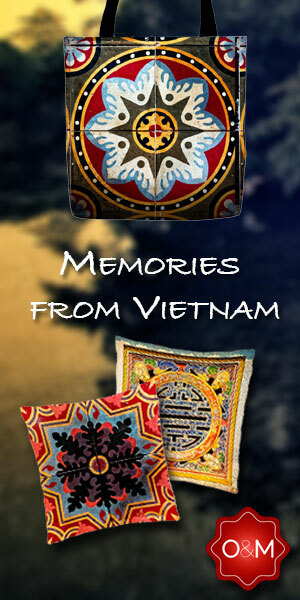 Another client of mine, Sophie Paris Vietnam, have their own branded helmets for sale, as seen below. 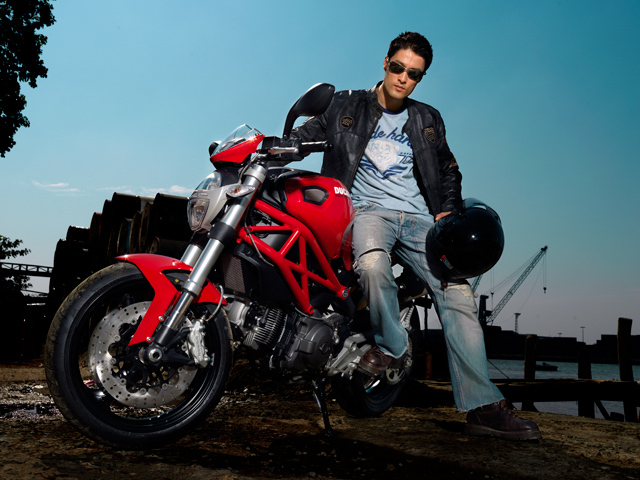 We photographed the bike and the models in studio and superimposed the background in Photoshop. Safest way to work while it is official rain season. 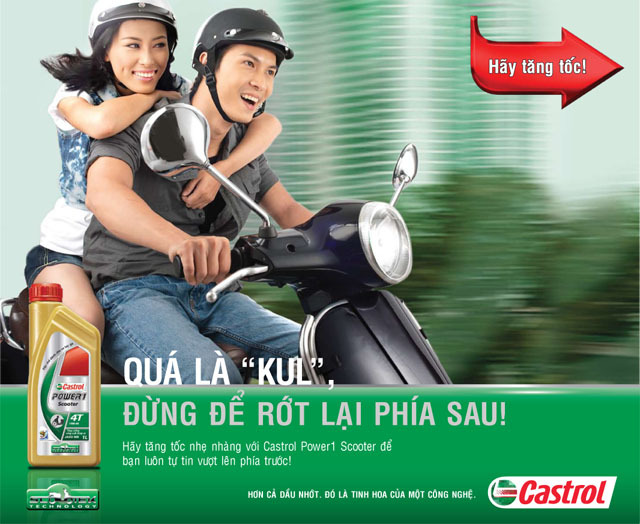 One of our latest assignments, for Castrol motorbike oil, was recently put on display on a billboard. 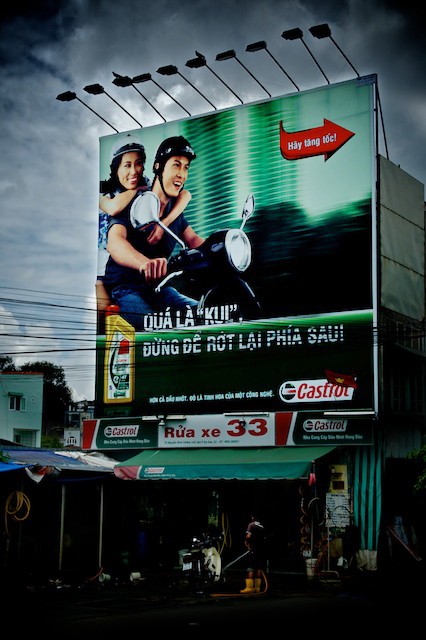 Castrol billboard in Ho Chi Minh City. From motorbike to motorbike helmets to motorbike oil it is only suitable to end it with motorbike parts. Saigon Scooter Centre is everything you need about vintage scooters and we are photographing their products. Item by item. Part by part. Full circle. 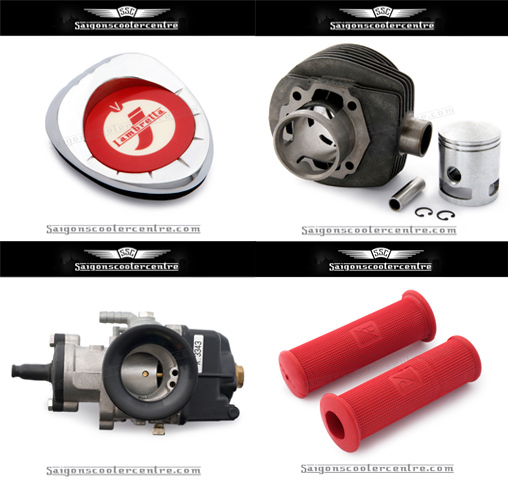 Product photography for Saigon Scooter Centre.